Barbara Mikulski, MSW ’65, was a social worker before launching her legendary and pioneering 45-year political career, but she doesn’t consider it a former job. “You know which one she chose,” Perman said with a smile. This type of thinking was present during her time in the House of Representatives (1976-1986) and in the Senate (1986-2017), she said, particularly in regard to bipartisanship. Mikulski, a Democrat, recalled that in the early 1990s a newly elected Republican senator from Texas, Kay Bailey Hutchison, reached out to her for a meeting and, despite her staff’s misgivings, she obliged. This led to a friendship with Hutchison and regular meetings among female senators from both political aisles, she said. Mikulski said that areas of agreement included promoting women’s economic empowerment and especially women’s health, and that the senators from opposing parties could find common ground on issues such as mammogram quality standards and breast cancer research funding. Staying on the topic of political relations, Perman asked about the state of affairs in Washington today and whether the partisan divide could ever be bridged. “How do these two parties at odds on absolutely everything find some common ground?” he said. 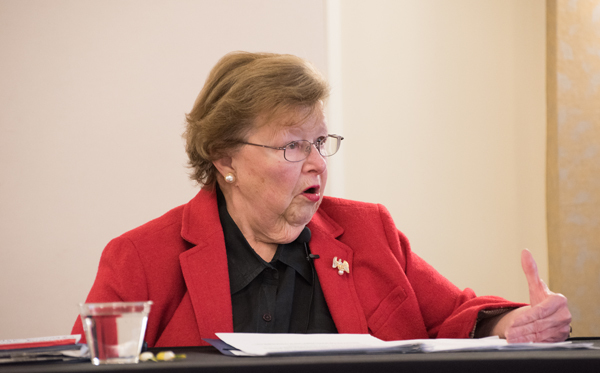 “The consequences for Baltimore and Maryland are significant,” Mikulski said. “Eighty-five percent of all federal funds that will come to Baltimore will be formula-driven, from Medicaid to mass transit, from Section 8 housing to school lunch programs. If we don’t get the census right, we will disadvantage ourselves for a decade — for a decade!